Security service suspects Oleksandr Onyshchenko of high treason. The Ukrainian Security Service (SBU) suspects fugitive people's deputy Oleksandr Onyshchenko of high treason, Head of the Main Investigation Department of the SBU Hryhoriy Ostafiychuk said on the TV channel 112 Ukraine on 1 December. "The SBU sees signs of high treason in Onyshchenko's actions and conducts the pre-trial investigation within criminal proceedings under the Article 111 (high treason) of the Criminal Code," he said. The SBU says the people's deputy has received Russian citizenship. "Onyshchenko has received Russian passport to evade criminal liability on the territory of Ukraine in exchange for naturalization in Russia. He has agreed to cooperate with the Russian authorities to destabilize the situation in Ukraine," Ostafiychuk went on. The SBU made public the correspondence of Onyshchenko's lawyer Tsygankov with a certain citizen D., whose identity should not be disclosed for the sake of the confidentiality of the investigation. Ostafiychuk said suspicion to Onyshchenko will be announced after the completion of the investigation. Oleksandr Onyshchenko is suspected of organizing a public funds embezzlement scheme (gas production and realization jointly with the PJSC Ukrgasvydobuvannia). As a result, the public property damage reached nearly 3bn hryvnya. On July 5, the Ukrainian parliament voted for bringing Onyshchenko to justice, as long as for his detention and arrest. 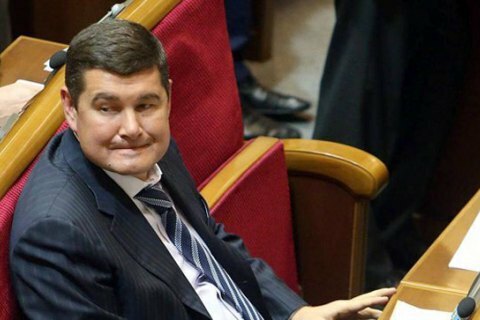 However, before the vote, Onyshchenko took advantage of his immunity and fled the country. On June 27, the Prosecutor-General of Ukraine issued the notice of suspicion against the Ukrainian MP Oleksandr Onyshchenko. On August 8, Onyshchenko was put on national wanted list.